Difference between revisions of "CO2MeterHacking"
The CO2 sensor inside the CO-100 (in the left of the picture) has a sticker saying ZGw063RY. Googling for this number reveals a CO2 module that looks just like the Voltcraft CO-100, so it appears that the CO-100 is basically just a rebranded [http://www.zyaura.com/products/ZGw063.asp ZyAura ZGw063RY] module. Googling for this number reveals a CO2 module that looks just like the Voltcraft CO-100, so it appears that the CO-100 is basically a rebranded [http://www.zyaura.com/products/ZGw063.asp ZyAura ZGw063RY] module. 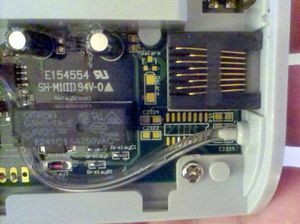 The CO-100 seems to miss a bunch of components that can be mounted on the PCB, close to the RJ45 connection (most likely an RS232 chip with charge pump capacitors). On the bottom left of the PCB is a set of pads that are marked with G, C, D, V, meaning Ground, Clock, Data, Voltage of the ZG01 sensor. The voltage level on the clock and data pins is 3.3V (the voltage on V pin is unknown). The voltage level on the clock and data pins is 3.3V (the voltage on V pin is 3.3V too). * Also attached to the arduino is an NRF24L01+ wireless transceiver, through which the CO2 measurement is sent to a central receiver (the one that also handles the Nomz-bell, Skip-button, etc.). Software has been written to interface an arduino to the clock and data lines of the ZG-01. The basic function of the software on the arduino is to wait until a CO2 measurement is received from the ZG-01, then send it using the wireless transceiver. It consists of an finite state machine (FSM) that processes the data line on each falling edge of the clock line. The FSM assumes that a new frame is starting when the time between bits is more than 3 milliseconds. Measurements of the CO2 ppm level are sent over the air using a 2.4 GHz NRF24L01+ module. The ZG-01 protocol is decoded using a simple state machine. On each falling edge of the clock line, a sample of the data line is taken until a total of 40 bits is received. If the time between a bit and the previous bit is longer than 2 milliseconds, it is assumed that a new 5-byte frame has started. * TODO: pin mapping of the NRF24L01+ module. [https://github.com/gcopeland/RF24a gcopeland fork of the RF24 library]. This library has several important fixes over the original RF24 library (and is used in the receiver as well). The source code can be found [https://github.com/bertrik/co2sensor on github]. * Attach an arduino to the G, C, D, V lines. The arduino takes power from the V-line and decodes the SPI-like signals from the ZG-01 on the C-line and D-line. * Connect an NRF24L01+ module to the arduino SPI port and send the CO2/temperature frames over the air to a central NRF24L01+ receiver (e.g. the one which handles the SkipButton, Nomz Bell). The unique 4-character id for the CO2 sensor is "CO_2". This requires only minimal modifications to the CO-100 modules itself and makes uses of the existing wireless infrastructure. This project is about hacking the Voltcraft CO-100 CO2-sensor, such that we can read the exact ppm value as displayed on the LCD. This particular CO2-sensor is present in the klusbunker at RevSpace and is currently used to control the ventilation in a crude manner (by monitoring the warning LEDs on the display module). Having the CO2 ppm value available as a number allows for nice things such as logging the levels over time, announce them on IRC, show them on the LedBanner , etc. 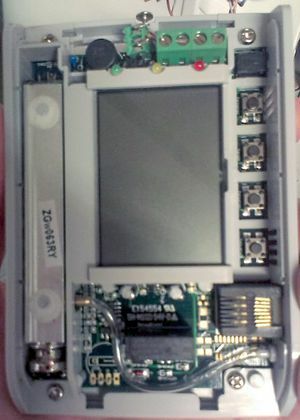 The CO2 sensor inside the CO-100 (in the left of the picture) has a sticker saying ZGw063RY. Googling for this number reveals a CO2 module that looks just like the Voltcraft CO-100, so it appears that the CO-100 is basically a rebranded ZyAura ZGw063RY module. The CO2 sensor in the CO-100 is a ZyAura ZG-01 module. This sensor uses the ZyAura protocol, which vaguely resembles SPI, see File:ZyAura CO2 Monitor Carbon Dioxide ZG01 Module english manual-1.pdf. On the bottom left of the PCB is a set of pads that are marked with G, C, D, V, meaning Ground, Clock, Data, Voltage of the ZG01 sensor. The voltage level on the clock and data pins is 3.3V (the voltage on V pin is 3.3V too). byte 0 is an identifier for the measurement item, e.g. whether it is a CO2 ppm value or a temperature. byte 2 is a checksum over bytes 0-2, just the sum modulo 256. Besides the CO2 ppm value and temperature, it also sends various other (so far unknown) measurement items. 0x52 'R' 10438 Barometric pressure? 0x56 'V' 10443 Barometric pressure? Also attached to the arduino is an NRF24L01+ wireless transceiver, through which the CO2 measurement is sent to a central receiver (the one that also handles the Nomz-bell, Skip-button, etc.). The ZG-01 protocol is decoded using a simple state machine. On each falling edge of the clock line, a sample of the data line is taken until a total of 40 bits is received. If the time between a bit and the previous bit is longer than 2 milliseconds, it is assumed that a new 5-byte frame has started. To control the NRF24L01+ wireless transceiver, we use the gcopeland fork of the RF24 library. This library has several important fixes over the original RF24 library (and is used in the receiver as well). The source code can be found on github.